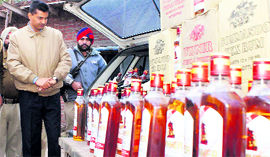 Living up to its notoriety of being a Bacchus-loving state where election time is synonymous with free flow of alcohol, poll-bound Punjab has brought true the worst fears of the Election Commission that liquor would flow freely here. Trust the Punjabi spirit(s). The rage and rancour of election hour is just the right occasion to demand some extra punch, or so it seemed, when popular Punjabi singer Gurdas Maan was invited by local Congress leaders at Doda village in Muktsar�s Gidderbaha Assembly constituency on Friday. Maan has a huge fan following in this part of the state. By June 2013, all Indians will have resident identity cards under the ongoing National Population Register (NPR) Scheme of the Home Ministry and unique identity numbers under the Aadhar scheme of the Planning Commission. Another turf war is on in the government - with the Ministry of Human Resource Development (HRD) actively considering a proposal to include 4 to 6-year-olds under the ambit of the Right to Education (RTE) Act and the Ministry of Women and Child Development (WCD) reminding them that preschool education was part of their mandate. 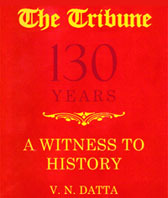 This letter that General Vijay Kumar Singh, Chief of Army Staff, wrote four years ago is being regarded as an important piece of evidence by the Ministry of Defence (MoD) when the General�s writ petition challenging the Union of India order over the matter of his correct date of birth comes up for hearing in the Supreme Court.